As hobbies go, wine making can be among the most satisfying: saving money over buying expensive wines, using fruits that otherwise might go to waste, bringing attention to the appreciation of eating well. Wine making can be as simple as stomping on grapes and letting them ferment with natural yeast from the skins of the grapes. It can be a little more complex when using other fruits: washing and mashing the fruit, adding water, sugar and yeast, and then watching the fermentation process. 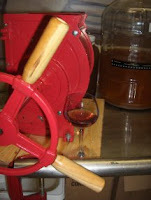 It can be as scientific as testing the specific gravity and acid content in order to determine the amount of sugar to be added and if the pH should also be adjusted; choosing specific varieties of yeast; adding enzymes, nutrients, and tannins and other enhancers; controlling the temperature during fermentation and other technical steps in the process. Commercial wineries age some of their wines in oak barrels and this can be adapted for the home wine maker. The equipment used by wine makers can vary as much as the techniques. Buckets, bowls and bags can be used as primary fermentation vessels. After the liquid is racked-off (siphoned off the “must” or fruit mash) it is usually put in glass jugs with narrow necks. Some use balloons on the top to allow the fermenting wine to release the carbon dioxide without allowing room air to enter the jug. A more controlled method is to use airlocks, wine makers’ tools which accomplish the same task, without the powdery substance that keeps balloons from sticking together falling into the wine. Carboys (large glass jugs made for wine and beer making), specific gravity testers, wine thieves (used to remove small amounts of wine from a carboy or barrel), thermometers, siphons, hoses, clamps, long handled spoons, cleaning equipment and a plethora of additives can be added to the supply list. Fifteen years ago I made grape, apple and beet wines using basic recipes and hoping for the best. Some were quite good, though very sweet. Other times the end product made me suspicious if it should actually be called wine and if it might be better not to drink it. Several years ago Ron took over the family wine making. He appreciates the scientific approach which results in a more consistent product; wine that we enjoy with meals and share with family and friends. “I keep careful records and write down everything I do. That way I know why my wines taste the way they do,” he said. Since we’ve handled wine and beer making supplies we’ve met other wine making enthusiasts. Some prefer the basic method, forgoing the more complicated steps in the process which might ensure a drinkable end product but increasing the learning curve. Others approach it with the zeal of having found a new avocation. Mark Parteka, who lives just outside of Browerville and is known to many in this area as the Sprint man, has been making wines for five or six years. He says when you start making wine be prepared to throw some out. He’s experimenting this year with honeyberries which were developed in Russia from the bitter honeysuckles. “I ordered the shrubs from Oregon three years ago,” he said. Parteka has also made apricot, peach, strawberry, raspberry, chokecherry, apple, rhubarb, and grape. He let’s his fishing crew and hunting buddies try out his wines. “They complain that they never get any more than a taste of the good ones,” he laughed. While wine makers often use fruits from local orchards, some chose to work with fruit that has been canned for wine making. This is especially useful when making wine after the seasonal fruits are no longer available. Mark Faust has experimented with the canned fruits and hopes to expand into grapes and plums that grow on his land east of Long Prairie. Loren and Celeste Miller are using apple juice. “We squeezed the apples and froze all the juice our freezer can hold. We’re going to make wine out of the rest,” Loren said. He’s been making apple juice the last four or five years. He made apple wine two years ago and this year added wild plum and rhubarb. Al Fortmann and Joel Anderson downloaded recipes from the internet. These recipes call for Campden tablets to sterilize the “must” of wild yeasts. They also suggest using yeast nutrients to get the fermentation process off to a good start. Tim Mikish makes wine in the fall as the plums, chokecherries and plums ripen. He likes using his own fruit but plans to experiment with the canned fruits as well. “I’m going to make blackberry and cranberry,” he said, indicating the Vitner’s Choice canned fruit on his stainless steel counter. John King, Amy Hunter, and LeRoy Williams have recently bottled the wines they made in one of Ron’s classes. They’re happy with the roughly thirty bottles produced from a six gallon start-up. John King made apricot wine and chose to make it sulfite-free. Some people are sensitive to sulfites and the home wine maker can adjust accordingly. King’s wine took a little longer to finish fermenting. King was pleased with his wine too. “I’m going to use some for gifts,” he said. Minnesota has about fifteen commercial wineries. Touring these wineries can be a fun weekend getaway. They can also help the home winemaker learn more about the process and provide taste comparisons. Buying commercial wines with the intent of learning the complexities and character of individual varieties can also be a pleasurable and educational process.